The English geographer and hydrographer Alexander George Findlay (1812-75) had observed that navigators of his time had to consult a considerable number of documents to gather the information they needed to sail the Pacific Ocean safely. Not only was this highly impractical, it also exposed seafarers to conflicting information that could lead to their demise. 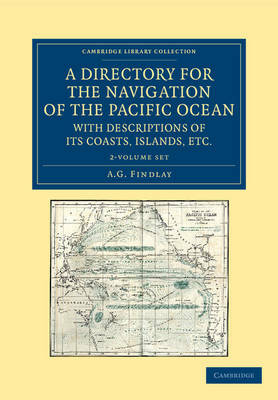 First published in 1851, this two-volume nautical directory, compiled by Findlay from reputable sources, provided seamen with a single comprehensive and authoritative reference work. Volume 1 covers the shores of the Pacific and is a collection of nautical coordinates, sailing instructions and detailed descriptions of the topography of the coastlines, as well as the winds, currents and tides affecting them. Volume 2 focuses on navigating the islands and archipelagos of the Pacific. An invaluable resource for navigators of the nineteenth century, this work remains of great interest to geographers, cartographers and scholars of nautical history.